As was so often the case, it all began with a ZX81. JON RITMAN was working as a TV engineer with Radio Rentals when they decided to do some market trails on renting out Ataris. Thinking there would be a need for specialist engineers if home micros caught on, Jon bought himself a ZX81 in January 1982 to find out for himself what these computers were all about. The bug caught Jon very quickly — he spent a week staying up till two in the morning, motoring through the manual that came with the ZX81, then scampered out and bought a RAMpack and a book on machine code. In 1983 Chris Clarke, one of the founder members of Crystal Computing which evolved into the present day Design Design, moved to Artic, working on the business side of games software, rather than as a programmer. Chris and Jon and were involved in the marketing of Bear Bovver and they got chatting about the sort of games that should be written on the Spectrum. They reckoned a good football game was called for. The duo looked at the Commodore 64 game, International Soccer, and talked to distributors who backed up their theory that what the Spectrum needed was a decent footie game. Chris had been programming on a ZX81, and after a bit of thought he and Jon decided to go it alone, leave Artic and write that Spectrum football game. One week after they started serious work, Artic released World Cup Football. Disaster loomed up large ... or did it? “We weren’t too worried, once we had seen it”, Jon confesses. Jon starts a new programming project by planning the gameplay — some programmers are programmers first of all, and tend to write for their own technical satisfaction: they’re keen on programming and gameplay often comes second. Simon Bratell, of Design Design works that way round, and finds a game to go with a technically excellent programming feat. Match Day was very successful, which took some of the financial pressures from the Ritman budget and Jon found he could afford to work at a more leisurely pace. “I saw Knight Lore soon after I’d finished work on Match Day and decided ‘this is the sort of world I like to see a game in — it’s just like playing a Disney cartoon’. The germ of an idea that became Batman nearly eighteen months later had been sown... Serious work on the new game began around Easter last year. Jon worked with a friend of his, Bernie Drummond on the Batman project — “Bernie used to draw just for fun,” Jon explained, and I asked him if he would be interested in doing some graphics for me. He agreed, and I let him have a copy of my drawing utility for the Spectrum. A couple of days later he came up with the first Batman graphics. 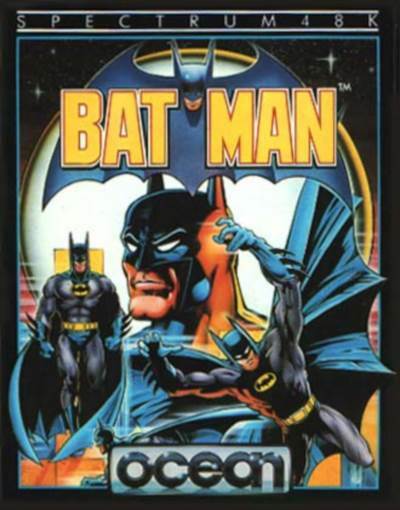 Batman wasn’t a stunningly original game in terms of concept, but it fared very well at the hands of reviewers — the game has appeared on the Spectrum, Amstrad, Amstrad PCW and on the Einstein. “It’s difficult to create something different. There are only six or so basic types of game, and three of them are down to Ultimate — I have got a lot of respect for them. As games designers, Chris and I are always looking for new directions in terms of gameplay but it is difficult to move off in a new direction. I’m not an innovator — I take a synthesis of good points. With Batman, take a room for instance: everything you need to solve it is in the room. I try to design a game for everyone, for the games buying public. I get a lot of satisfaction from writing a game and pleasing people — although the money’s nice!”, Jon adds. “A lot of people spend six or eight months on a game and then two or three days at the end, putting the rooms together. The end result may be technically good, but the gameplay is often bad — people seem to get fed up with a project and want to get it out of the door. I can never really tell how long it will take to complete an original game. In the last week of the project I get some friends along to play the game and then alter it — in the case of Batman, I swapped a lot of rooms around when my girlfriend had played it. Next football game? Yes it’s true! The men who brought you Match Day are currently working on a football simulation which has the working title Three and In because the gameplay follows the rules of Three and In! Bernie Drummond has been roped in to help on the graphics and Chris and Jon hope to have the game ready in time for this Christmas. There will be two players to each side, and the animations are going to be large. At the start, the first task is to pick your team — the computerised footballers each have their own playing and passing skills, and the choice of players will influence the outcome of a game. One, two or three people will be able to play. It’s early days in the development at the moment — but Jon is keen to get as much realistic detail into the game as possible: the players will run around looking behind them, for instance. Foot and Mouth is the other game currently under production at chateau Ritman. The game stars the two halves of a symbiotic creature — Foot, and Mouth — and they look like a human being split at the waist when they are together. F and M have been split apart by an evil being, and the ultimate aim is for them to reunite. Each half of the composite creature has special abilities and there will be two control methods in the game, one for Foot and one for Mouth. The game is going to use the same 3D viewpoint as Batman, and will be room-based, only this time Jon is aiming for at least three hundred rooms. Three kinds of puzzle are planned for F&M — one kind of puzzle that Foot can solve, one that Mouth can overcome and a third that can only be solved by Foot and Mouth together, once they have been reunited as a composite being.